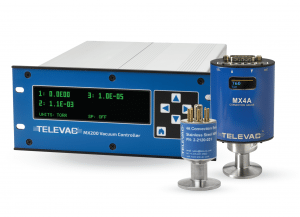 The Televac 4A convection sensor now gives you ±10% accuracy from 1×10-2 Torr (10 microns) to 1000 Torr (above atmosphere) when used with the MX200 or MX4A. Improvements to our newest vacuum controllers and active gauges, including all versions of the Televac MX200 controller and Televac MX4A active gauge, the 4A convection sensor (also called a thermocouple or Pirani) will provide ±10% accuracy from 1×10-2 Torr (10 microns) to 1000 Torr (above atmosphere). This level of accuracy is unique to Televac and not available in competing thermal filament-based vacuum sensors, especially at this price point. The substantial accuracy improvement will benefit end users across many industries, especially heat treat and vacuum furnace applications where NADCAP-related processing standards require extremely high accuracy. For more information on the 4A and other Televac products, visit our website, email us at [email protected], or call us at +1 215-947-2500.